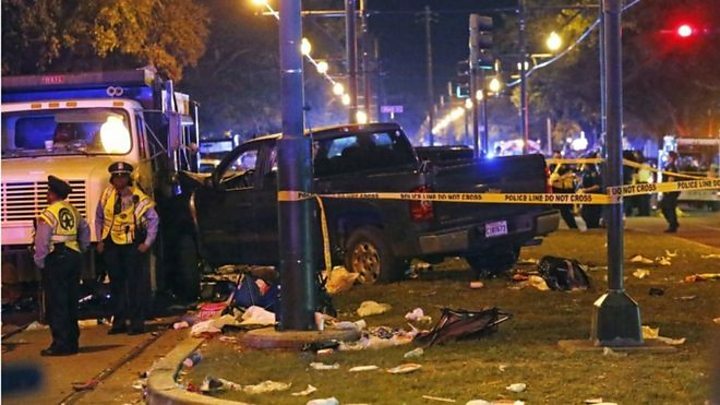 A vehicle has driven into a crowd at a Mardi Gras parade in the US city of New Orleans, leaving 28 people injured, some seriously. It hit crowds watching the Krewe of Endymion parade in the Mid-City district early on Saturday evening. One person was in custody on suspicion of driving while intoxicated, police said, and terrorism was not suspected. The driver of the pick-up truck seemed unaware of what he had done, one eyewitness told local media. "He was just kind of out of it,'' Kourtney McKinnis told the New Orleans Advocate. Police Chief Michael Harrison said 21 people were taken to hospital, five in serious condition, with another seven also injured. A police officer was among the injured, he said. Social clubs, known as Krewes, organise different parades in New Orleans during Mardi Gras.